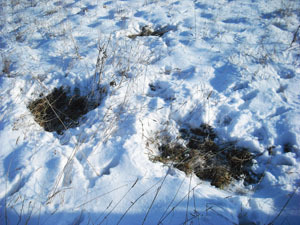 Deer beds are oval-shaped impressions left in the grass, leaves, or snow where deer have decided to lay down. Whether or not deer use them for actual sleeping is debatable... Deer sometimes will lay their heads back on their hind legs with there eyes closed and for all intent and purpose, this is sleep. But, I believe the main reasons deer bed down is to preserve energy and chew their cud. Deer are herbivorous (plant eaters) and eat large amounts of food as quickly as possible so that they can get back to the safety of thick cover. While bedded, deer regurgitate small amounts of food, re-chew it and then swallow it to be re-digested. Deer will spend six to seven hours a day chewing their cud, although rarely spending more than twenty minutes at a time doing so. Deer that bed down in a snow storm will likely remain bedded, sometimes for several days if they feel secure, until the storm passes. They can be buried in snow, yet stay completely warm. The insolating qualities of their hollow haired fur coat prevents snow from melting on their body, which acts as additional insulation. In the hot summer months, you might find deer trying to beat the heat and avoid the biting insects by lying in water. 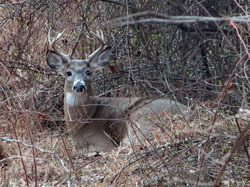 During the cold winters, whitetails seek protection from cold winds in swamps and low-lying thickets. But generally whitetails prefur the higher hill sides and ridges, which aids in detecting dangers such as predators and hunters. Does, yearlings and fawns will bed within a few feet of each other, while mature bucks will try to find small patches of cover. Some buck are so well hidden while bedded that you can be looking right at them without seeing them. A big old buck can live to a ripe old age because of his ability to find secluded bedding areas. A deer's bedding area in relationship to it's feeding area will determine the amount of time it spends on the move, traveling from one spot to the other. If a deer feels relatively unpressured it will bed near it's food supply, next to an oak stand with a good acorn crop, or even in a cornfield. Deer that are heavily pressured will find a more remote spot such as a swamp or dence thicket, and may spend more time on the move because of the increased distance from it's food source. 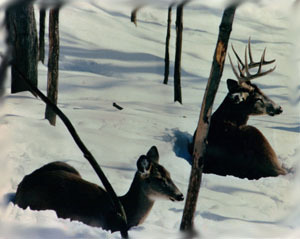 Whitetail beds are most visible in the snow. They stick out as dark spots on the white snow cover. One thing is for certain... if you find a deer bed or beds you know that deer have been there.. often you can tell how many have been there by the number of beds versus the number of different tracks in the snow surrounding the beds. It is not uncommon to find several beds that belong to the same animal. Big bucks will often get up and rebed in the same area several times during the course of the day to stretch their muscles or seek better cover. Although a buck is quite relaxed in his bed, you can count on him being just as alert. It is extrememly hard to sneak up on a bedded buck. Even the best big buck trackers get busted more often than not when looking for a bedded buck. The closer you get to a bucks bedding area, the stealthier you must be. Every step must be slow and deliberate with long breaks between to scan the entire area looking for the smallest piece of the whitetails body. Every small step actually offers a new vantage point that may allow you to see part of the buck. Don't be looking for the entire deer... you probably will not find it. A buck will most certainly bed where he can't be seen and always where he has the advantage over any approaching danger. It is best to look for parts of the buck, like an ear, pieces of antler, or a tuft of brown fur amongst the white snow. If you are lucky and patient enough, you may even catch a small movement by the buck that gives his position away. Finding a bedded buck is a contest of patience between you and the buck, and an old buck has plenty of patience. A good rule to remember is... if you think you're moving slow enough, you probably need to go slower.